NJDEP wants to recognize the employers in New Jersey that are making their workplaces “Electric Vehicle-Ready.” By providing workplace charging for electric vehicles, these employers are becoming more sustainable and are helping to reduce emissions of air pollutants from cars, improve our environment, and improve the bottom line for their employees that drive to work. All employers are invited to participate, whether private, government, educational or non-profit. Install a minimum of 2 charging stations (Level 1/120 Volt or Level 2/240 Volt). Installations as early as January 1, 2018 will be accepted. 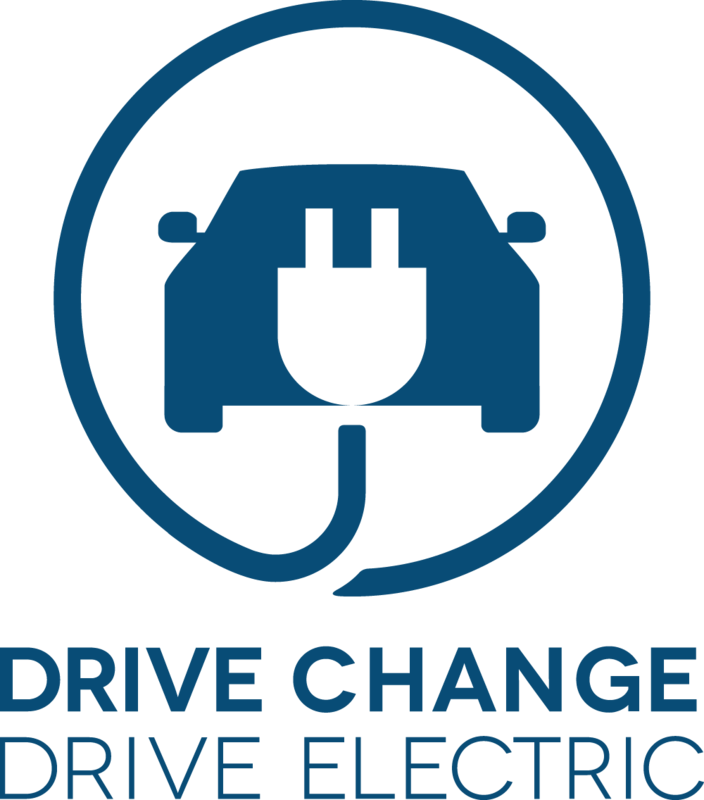 Complete an NJ Charging Challenge application form and submit with proof of installation to DriveGreen@dep.nj.gov by Friday, October 25th at 5:00 p.m. Parking spaces must be dedicated to charging station use only. Recognition will include a certificate from the DEP, as well as website recognition. All applicants who meet the qualifications will receive recognition. The top performers in the Charging Challenge will be honored at the Governor’s Environmental Excellence Awards ceremony at the end of the year. Congratulations to the winners of the 2018 NJ Charging Challenge: Electrify Your Workplace recognition program! The awards were presented at the 2018 Governor’s Environmental Excellence Awards ceremony on December 10th, at the New Jersey State Museum in Trenton. Descriptions and photos for each of our winners are below. Raritan Valley Community College (RVCC) installed two dual-port Level 2 charging stations at their campus in Branchburg. College staff also conducted outreach activities related to the new charging stations, including the circulation of emails about the stations to all students and employees, and the posting of information about electric vehicles at the college’s website for campus transportation services. The electric vehicle charging stations are a great addition to their solar panel array. RVCC participated in NJDEP’s It Pays to Plug In: NJ’s Electric Vehicle Charging Grant Program for the equipment and installation. 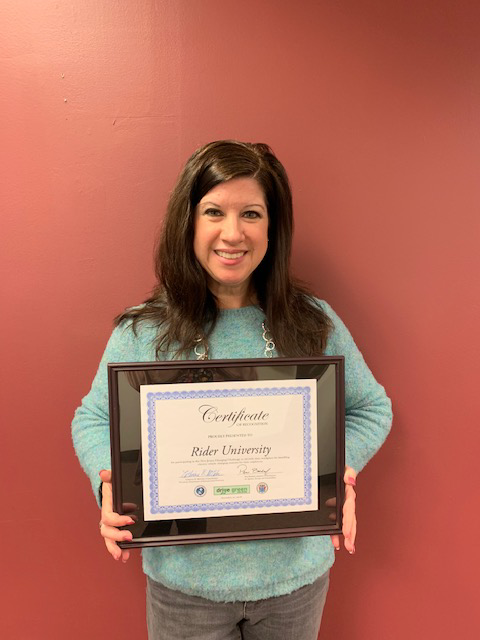 Sustainability efforts at RVCC have been taking place since signing a Memorandum of Understanding with EPA in 2009, becoming the first community college in the nation to sign the Environmental Stewardship Agreement. The RVCC campus has a solar array and co-generation plant that help to power their energy efficient buildings, reducing its carbon footprint by 22,579 metric tons in eight years, and becoming carbon neutral in 2017. Rider University installed 5 single-port Level 2 charging stations for University faculty, staff, and student use. They also undertook various outreach activities: They send email blasts and other ads inviting Rider EV drivers to sign up for a free account. They have also introduced the Liberty Access app that allows users to track kilowatt-hours charged and their impact. They have also created a group through the “What’s App” smart phone application for account holders to communicate with each other when charging stations are full or available for use. Informational material on the eV Charger program has been worked into student orientation sessions as a free perk on campus. Congratulations to the winners of the 2017 NJ Charging Challenge: Electrify Your Workplace recognition program! at the New Jersey State Museum in Trenton. Descriptions and photos for each of our winners are below. Certificate of Recognition: NRG Energy, Inc.
NRG Energy, Inc. installed two single-port and seven dual-port Level 2 charging stations, and two DC fast charging stations at their facility in Princeton, as well as extra conduits under the parking lot for future charging stations. Over the course of a year, they held 29 building tours that highlighted the charging stations. NRG maintains an impressive use of renewable energy at this facility which includes solar panels, underground cisterns holding rain capture for toilets and urinals, energy storage, 250 kW of combined heat and power (CHP), a 45-ton absorber that operates off of the heat rejection from the CHP, baseboard hot water enhanced by the CHP heat rejection as well as ice melt under the front walk ways, two wind turbines, and more. 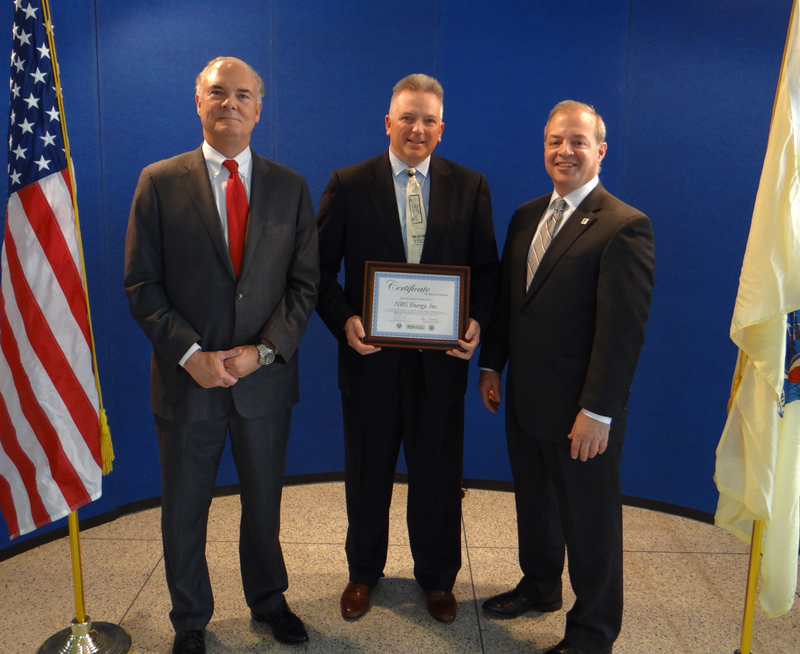 NJDEP Commissioner Bob Martin, Bill Walsh, Director/Head of Corporate Facilities, and NJEIT Executive Director David Zimmer. Verizon Corporation has committed to installing charging stations at 50 of their locations by 2018. As of 2017, they have installed charging stations at all four of their facilities in New Jersey. They recently installed charging stations at their Basking Ridge facility through NJDEP’s It Pays to Plug In: NJ’s Electric Vehicle Workplace Charging Grant Program, where they also have solar panels helping to power the facility. To get the word out, they highlighted the stations in their employee newsletter, send out local employee e-cards, held a Green Bag Webinar, participated in a Green Commuting Tree Planting Initiative where they planted a tree for every employee that signed up for a green commuting program, and mentioned all new EV charging installations via their Twitter @VerizonGreen. NJDEP Commissioner Bob Martin, Tara Neilan, Sustainability Specialist, Jason Hendrickson, Senior Manager of Network Engineering and Operations, and NJEIT Executive Director David Zimmer. The College of New Jersey (TCNJ) has ten Level 2 charging stations in its commuter student parking garage, and are used by both commuting faculty and students. The installation resulted from a unique partnership between the Ewing school and PSEG – TCNJ committed to using the charging stations for faculty and staff, and PSEG provided the electric vehicle charging equipment for free. 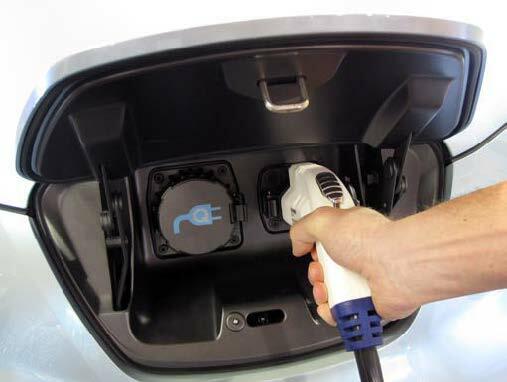 TCNJ participated in NJDEP’s It Pays to Plug In: NJ’s Electric Vehicle Workplace Charging Grant Program for the equipment installation and TCNJ is responsible for ongoing maintenance and electricity costs. Installation of the stations received widespread media coverage, from the campus newspaper to network television news in Philadelphia. 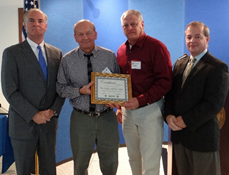 NJDEP Commissioner Bob Martin, Jack Fehn, Energy Systems Specialist, Tom Schweitzer, Life Safety Specialist, and NJEIT Executive Director David Zimmer. We would like to recognize the rest of the participants in the NJ Charging Challenge: Electrify Your Workplace Recognition Program. ACUA installed nine Level 2 charging stations between its Egg Harbor Township and Atlantic City locations. ACUA vehicles charge with renewable energy at both locations, Egg Harbor Township (landfill gas) and Atlantic City (wind and solar). They have promoted these chargers through newsletters, social media, website, newspaper ads, and they have been a National Drive Electric Week participant for three years. NJCU installed five Level 2 charging stations through NJDEP’s It Pays to Plug In: NJ’s Electric Vehicle Workplace Charging Grant Program in their commuter parking garage. They spread the word via email announcements, an Info Article on Gothicnet, a procedures policy, a one page Info Poster, and a GovernmentFleet Article. Domain Computer Services, Inc. installed two Level 2 charging stations at their facility in Cranbury. They got the word out through two blog articles and their “About Us” page on their website. 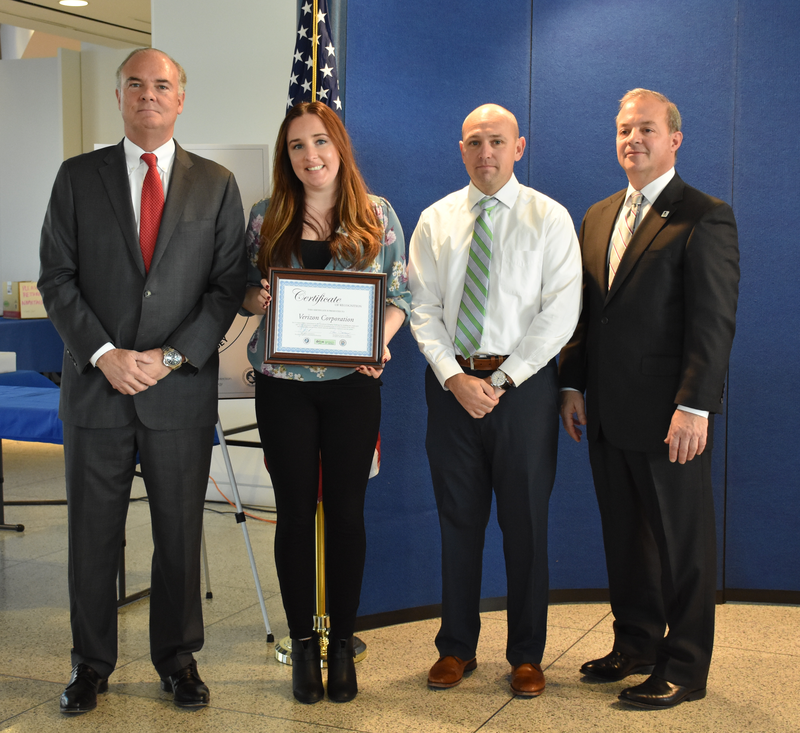 Congratulations to the winners of the 2016 NJ Charging Challenge: Electrify Your Workplace recognition program! 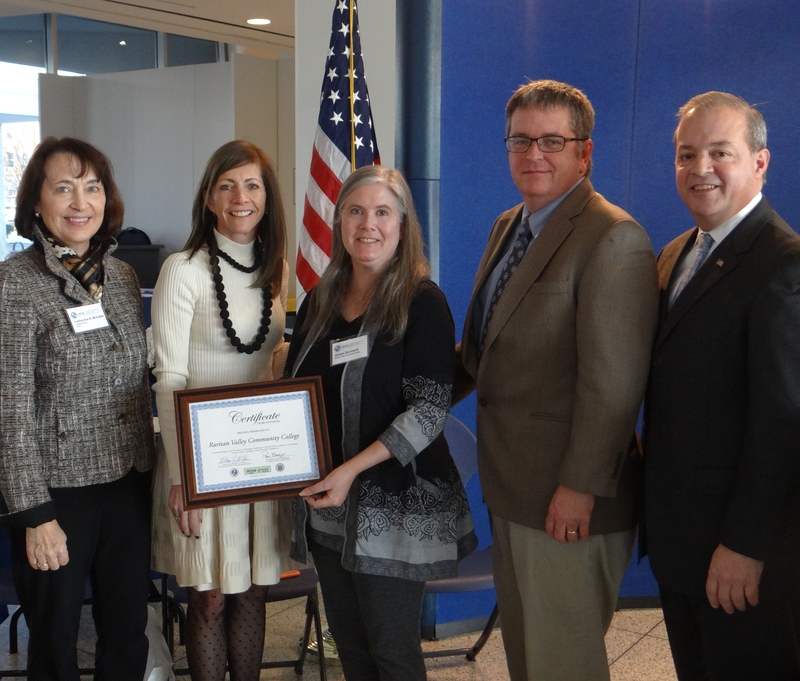 The awards were presented at the 2016 Governor’s Environmental Excellence Awards ceremony on December 7th, at the New Jersey State Museum in Trenton. Descriptions and photos for each of our winners are below. The utility in 2015 installed 30 Level 2 charging stations, bringing to 45 the number of stations installed statewide at PSEG facilities. The 2015 installation included 10 stations in a Newark parking garage, 10 stations at the company’s Training Center in Edison, and 10 stations at its Central Maintenance Facility in Edison. PSEG has also implemented an extensive educational campaign to promote the use of electric vehicles by employees and customers. There has been a feature story in a company magazine, two write-ups in a company blog about the benefits of electric vehicle use, and promotional material sent to employees about installation of charging stations at a hospital in New Brunswick, Middlesex County. 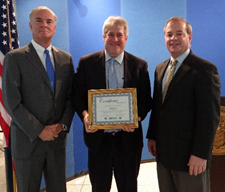 NJDEP Commissioner Bob Martin, Paul Lief Rosengren, Director of PSEG Communications, and NJEIT Executive Director David Zimmer. The College of New Jersey (TCNJ) has five Level 2 charging stations in its commuter student parking garage that have been operational for approximately one year, and are used by both commuting faculty and students. The installation resulted from a unique partnership between the Ewing school and PSEG -- TCNJ committed to using the charging stations for faculty and staff, and PSEG provided the electric vehicle charging equipment for free. TCNJ paid for the equipment installation and is responsible for ongoing maintenance and electricity costs. A ribbon-cutting event to highlight the partnership and promote the use of Electric Vehicle Charging Stations was held in July 2016. Installation of the stations received widespread media coverage, from the campus newspaper to network television news in Philadelphia. 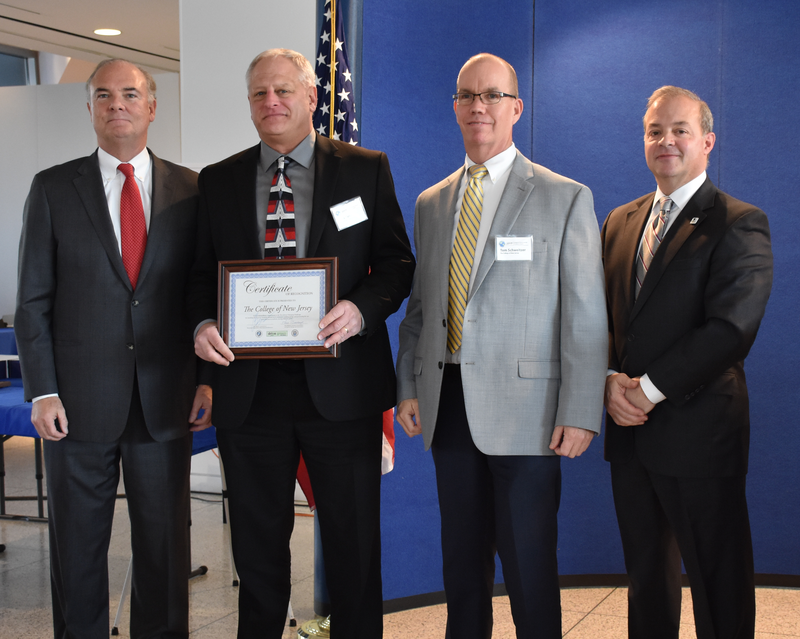 NJDEP Commissioner Bob Martin, Gunther Karlowitsch, Crew Supervisor of Building Maintenance Program, TCNJ, Jack Fehn, Electronic Security Specialist, College of New Jersey, and NJEIT Executive Director David Zimmer.